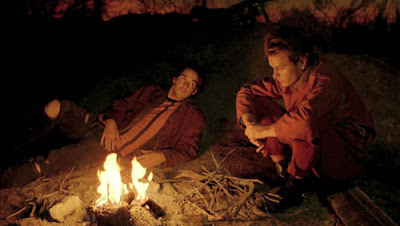 My Own Private Idaho's storylines overlap like a Venn diagram: there's Mike (River Phoenix), a young, gay, narcoleptic street hustler in the Pacific Northwest who keeps having dreams about his mother back in Idaho. He soon embarks on an odyssey to track her down, aided by his best friend and fellow prostitute, Scott (Keanu Reeves). He, a bit like Prince Hal of Henry IV (and complete with his own Falstaff by way of the portly but eloquent Bob Pigeon played by William Richert), comes from a family of wealth, and plans to collect his inheritance and clean up his act when he turns 21, hoping that his dramatic transformation will impress his disillusioned father. Central to Gus Van Sant's 20-year-old film — and where the diagram intersects — is the bond between Mike and Scott, a strong friendship with the potential for something more significant, and this colorful and bold film approaches the topic with a delicate and understanding touch. Idaho's mixture of styles and influences is fascinating thanks in part to Van Sant's ability to balance it all, preventing it from becoming a clashing jumble of unrelated ideas. Most notable, of course, is how the film takes its Shakespearean influence to literal levels, mimicking the Bard's theatrical style whenever the character of Bob Pigeon shows up. From a shift in storytelling technique, such as the addition of lengthy monologues and character pranks, to even the very language that the characters speak ("Are you not a coward? Answer that, and that goes double! "), these sequences (which occasionally resemble Dickens as well) stick out for sure, but not necessarily negatively. Van Sant integrates them well enough into his surreal narrative, such that it almost makes sense that this gang of street hustlers and trick-turners might abandon contractions and slang in favor of more lyrical words; why not? But all of this is anchored by a single scene right in the middle of the film, a scene that stops with the cockeyed cinematography and the Shakespearean touches and the narcolepsy, just for a few moments. Scott and Mike, stuck in the fields of Idaho for the night, sit around a campfire. Mike attempts to have a real, personal conversation with Scott, who constantly counters with jokes, prompting Mike to try to break through that barrier, eventually confessing his desire to be "closer" to Scott, closer in a way that even best friends can't be. The quiet scene is so honest because Phoenix is so honest in it. His voice, his fiddling with a pile of nearby sticks, his eye-contact (or lack thereof) — he brings it all together not with showiness or flare, but with such soft sensitivity and delicacy. As the scene progresses, I find myself pulled closer and closer to the screen each time. For all the stylistic and creative touches of the film, this is Idaho's biggest "wow" moment, and it simply involves Van Sant allowing his camera to roll while one character finally opens up to another. While nearly every line, every moment of Phoenix's performance in this scene is worthy of dissection and analysis (when Scott states that two guys can't love each other, I adore Mike's attempt to be tactful and sensitive by initially agreeing, "Yeah…Well, I don't know, I mean…" The scene hits a striking, painful climax when Mike finally and desperately confesses, "I really wanna kiss you, man." I reckon all of us have experienced this conversation and these moments in some capacity; gay or straight, this is a universally brave and painful confession to make or even to hear. My wife, way before she was my wife, went out on a similar limb as Mike, revealing a love for me while I was still with someone else, conveying feelings I wasn't allowed to reciprocate. The memory almost haunts me. I remember where the sun was shining from, where I was sitting and where she was standing, the way she couldn't stop fiddling with her nails and the way I couldn't look her in the eye. And I remember her "I really wanna kiss you, man" moment as well. It's such a beautiful memory and I love her every day for taking that plunge, but it's also a memory that I can barely stand to think about because I know how vulnerable she allowed herself to be. So when Mike says, "I really wanna kiss you, man," I can't help but gasp — in pain, empathy and admiration. Just as the first half of My Own Private Idaho seemed to build up to this scene, the second half builds from it. Mike must go through the pain of having Scott's friendship but not his love as their journey takes them through Idaho, then to Italy, but back to America on separate planes and separate paths. Much of the film passes by in a flurry of Shakespearean speeches, home video-style dream reels and faux-freeze-frames of sexual encounters (the actors simply standing very still as the camera rolls). There aren't too many scenes of downtime in Idaho, which is rather impressive considering how well we feel we know these characters. All these little pieces, like torn scraps of paper, are layered on top of each other and held together by the likes of that campfire conversation, or the scene where the boys visit Mike's brother to learn who his real father was. 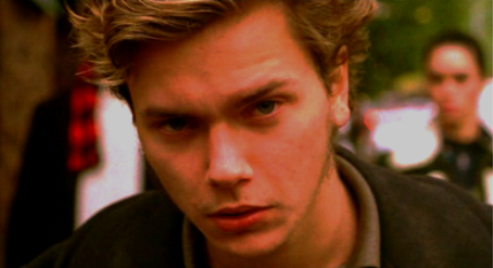 It's this way (with the help of River Phoenix's for-the-ages performance) that Van Sant is able to create his very personal and very moving collage.